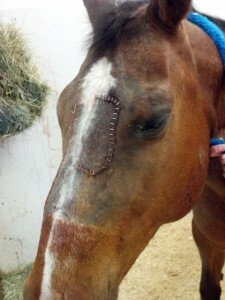 Penny is a Senior QH mare that came to RCER because of tumors in her nose that were blocking her breathing. 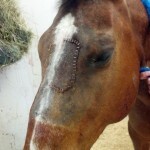 In 2011 Penny had laser treatment and surgery for the tumors on her right side of her face and she recovered well. She was adopted by Marty and Michelle. Recently, Penny had another large blood clot and tumor on the left side of her face. On 6-13-13 Penny had surgery at WSU and came through like the trooper she has always been. She has a great will to survive and many Thanks to to her adoptive parents for providing her with that opportunity.